Whoever named the Atlas Cocktail knew his Greek mythology. It seems appropriate that this unusually strong apple brandy cocktail should be named after the Titan Atlas. I was aware of the general outlines of the Atlas story—the Titan was on the losing side of the war with the Olympians, and so was condemned to forever hold up the weight of the heavens—but it was only after I excavated my old copy of Bulfinch’s Mythology that I was reminded that he is also associated with one of Hercules’s labors, the one about fetching up some golden apples for the pleasure of the Olympic gods. Apples, impressive strength—yes, it’s a clever fit. Shake (stir) until very cold; strain into a chilled cocktail glass. Optionally, express and garnish with lemon. Gale and Marco list the proportions as 2:1:1, as shown here, but I’ve found that 3:1:1 works well, too; depends on the brandy, I suspect. I’ve tried a number of substitutions, since my listed ingredients aren’t readily available everywhere. It turns out that the Atlas is quite resilient. 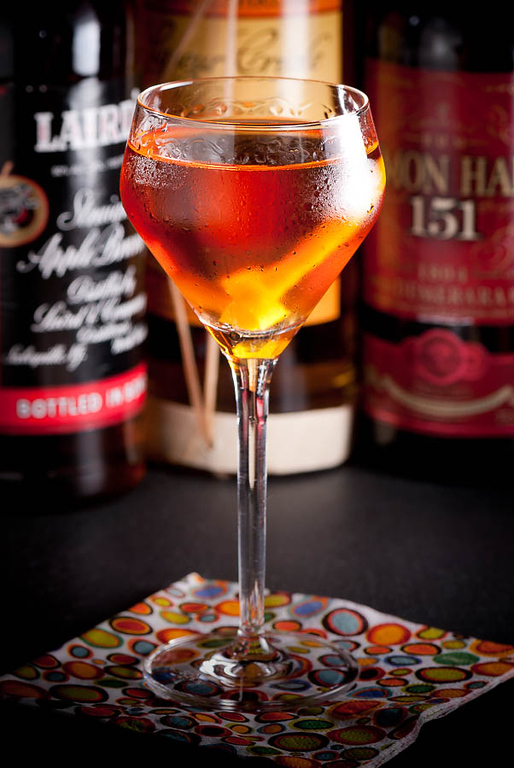 For example, I used Laird’s because I had no Calvados. I don’t feel too badly about that—the Laird’s Straight Brandy is a pretty good drink, and I had an unopened bottle just loitering about my cabinet, looking for something to do. That turned out quite well. I experimented with both Cointreau and Clément; the latter seemed to blend a little better, while the Cointreau seemed aggressively sweet to my palate. (But then, Cointreau always seems overly sweet to me…) If you use Cointreau, you may want to cut back the proportion a bit, unless you’re looking for that little extra sweetness. Gale and Marco don’t call for a garnish, but the lemon is a welcome addition; it goes nicely with the apple brandy, and helps blend the rum. “Drinking with Titans: The Atlas Cocktail” at cold-glass.com : All text and photos © 2011 Douglas M. Ford. All rights reserved. Nice, I have been looking for something just like this. Have you tried replacing the Cointreau with other flavors? As a matter of fact, I recommend the Clement Creole in the Atlas (if you can get it.) It’s rum based, and seems a natural for the apple and the demerara rum. I also tried Patron’s Citronge and Grand Marnier. Clement is the best match of the lot, I believe. I also have a bottle of Laird’s I’ve been casting about for something to do with, so I may give this a try after I get some Demerara (which I feel like I should keep around anyway, you know? ).